250 million years ago, roughly 95% of the species on Earth went extinct in what's often called "the great dying." Megavolcanoes in Siberia were partly to blame. But what caused those volcanoes to erupt so powerfully, for centuries on end? Geologists have known about these megavolcanoes for decades - they left behind 2 million square kilometers of volcanic rock in Siberia, now known as the Siberian traps. When the lava first began pouring from the Earth, it probably paved over as much as 7 million square kilometers of Siberia, and continued to erupt almost continuously for a million years. Gasses and particles from the explosion changed the composition of our atmosphere, killing many species. 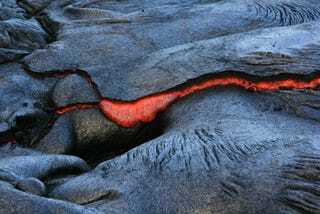 Why were the lava spurts so huge, and why don't we see more of them today? With John A. Tarduno of Rochester University, Aleksey Smirnov has showed that the Siberian traps formed when Siberia was drifting over the Earth's mantle now underlying the North Atlantic region. The mantle is a rocky, mostly solid layer about 2,800 kilometers (1,700-plus miles) thick between the earth's crust and its core. Volcanoes are extremely common there, creating Iceland, for example. The reigning theory for a number of years holds that the volcanoes originated much closer to the Earth's surface, but Smirnov and his colleagues determined that this wouldn't provide enough energy for such an enormous expulsion of lava. "After ten years of research, we have contributed convincing support to the theory of mantle plumes originating near the earth's core and transporting heat and material to the earth's surface," Smirnov says. Their research also suggests that the deeper parts of the earth's mantle are able to maintain a large chemical or thermal imbalance for hundreds of millions of years. "We asked, "Why did it appear there in the middle of the Eurasian continent?" Smirnov says. There was enough basalt to cover all of Western Europe with one kilometer of lava-at least three million cubic kilometers. "A deep mantle plume could explain this, but where was it located, and did it survive to the present day?" Their "pulsing plume" model for the Siberian traps points to an eruption over that same mantle in the North Atlantic. "The same location of the Siberian Trap and North Atlantic eruptions cannot be explained with the non-plume model," Smirnov says . . . "Overall, this study contributes to better understanding the Earth's "heat engine" that drives the active tectonics or geological processes of the earth, from earthquakes to mountain-building," says Smirnov. "It suggests that the necessary energy probably originates from the deep mantle." In other words, truly giant volcanoes come from deep within the Earth - and probably the forces that drive plate tectonics also drove the formation of the Siberian traps. You want a takeaway doomsday message from all this? Built into the deep structure of the planet is an engine that can destroy nearly all life on its surface.